Though probably very much older, the earliest mention of South Cave in literature appears in the 11th Century. The origins of the name ‘Cave’ are unknown, the most likely being the Anglian ‘caf’ meaning a fast flowing stream. The town was granted a charter to hold a market and fair by King Edward I in 1291, and in 1796 a purpose-built market hall was built in the Market Place. The market died out in the 1850s and the fair in 1939. The parish of South Cave has an irregular shape – extending from Weedley in the east to Broomfleet in the west, Drewton in the north and the Humber bank in the south. It covers some 2,361 hectares (5,834 acres). At present there are around 1,761 dwellings in the town, with a population of around 4,500. There is one place of worship, All Saints Church. Other amenities include a GP and dental practice; mobile optician; pharmacist; post office and banking facilities; library; two public houses; several shops; two hotels and sports facilities. Further details are included in the guide to activities, amenities and services, as published by the Parish Council. Formed in 1896, the Council first occupied the Town Hall in 1906. This building was formerly the Market Hall and Cross School. The Grade II listed building was built in 1796 by Henry Boldero Barnard of Cave Castle. The ground floor front was formerly the open arcade market hall. It has remained largely, unaltered. The first floor Council Chamber was the rent room until 1841, when it was converted into a schoolroom, and the rear of the building used to be the schoolmaster’s family home. The Parish Council is currently made up of 11 members. It is responsible for the administration of the allotments, cemetery, Town Hall, footpaths (including lighting and seats), litter bins and open spaces (such as the play park and King George V playing field). The Parish Council also has the right to make comments on any planning application, which the Local Planning Authority must take into account. The business of the Council is conducted by at meetings held at 7pm in the Town Hall on the third Monday of each month, except August. The Council’s work is sometimes carried out by committees, and then brought to Council for approval. The Council is also able to call on the expertise of tree and footpath wardens and a buildings advisor. Robert Sharp was the headmaster of South Cave Village School from 1804 until his death in 1843. 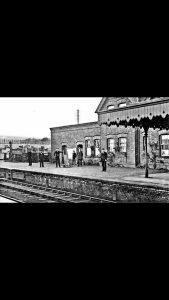 Do you have any information on South Cave’s history? If so, get in touch and let us know.